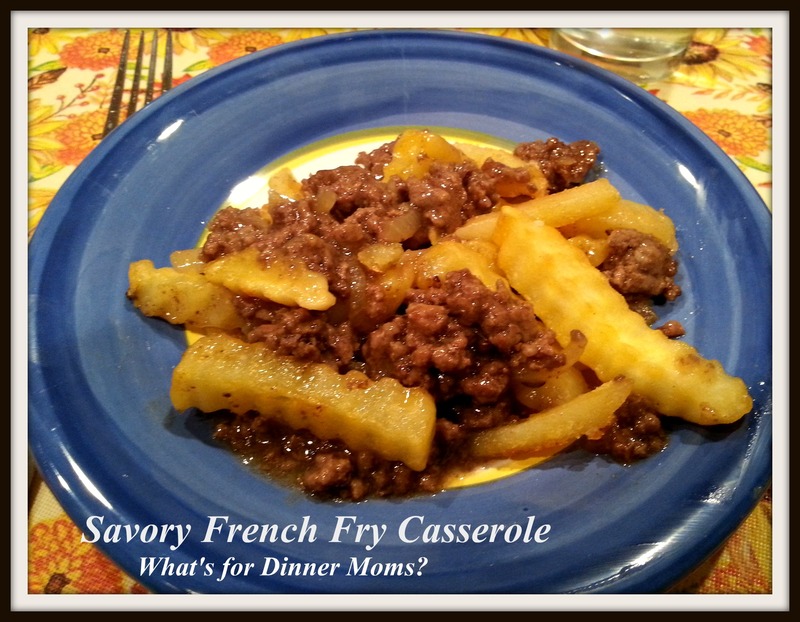 Savory French Fry Casserole – What's for Dinner Moms? Well, at the Feis (Irish Arts/Dance Competition) this weekend my daughter severely sprained her left foot. Which wouldn’t be so bad if she hadn’t already had a brace on because she sprained her right ankle. So, after an x-ray at the Emergency Room she has a boot on her left foot. No, dancing for at least 2 weeks and possibly longer depending on when the Physical Therapist clears her. This sounds horrible but it clears up quite a bit of time for me. I only have to drive to Kalamazoo once a week rather than three times a week for dance classes. Though I miss the dance moms I love having the 8-10 hours in my week. I don’t even know it we are going to be able to keep up with the once a week after sitting on the floor last night watching everyone else dance my daughter was upset because it was difficult for her to sit still and watch everyone else dance. I am going to have her keep going and watch the other girls because even last night she was able to sit back and say, “I know X is having trouble because of her knees.” This is not something she would have noticed before and I hope she can take what she sees and correct it in herself. So, with all my new spare time I am trying to use up some of those last bits and pieces in my basement freezer before restocking for the holidays. One of the kids took out ground beef and I found 2 half bags of french fries that needed to be used up. What do I do? Create a new casserole. My family tends to like savory flavors in food. Most of the French Fry Casserole recipes I found were tomato sauce based or cheese based. I wanted something different so I created it. This dish had a deep rich flavor that is slightly similar to a cottage pie or a Salisbury steak. My family really liked it. This dish not work as leftovers though as the french fries got soggy in the sauce over night. But, it was worth trying. I served this with cut up vegetables and a side of dressing for dipping for an easy meal. Place French fries on a baking sheet and begin baking according to package directions. You will want to cook French fries to an almost done state. They should be turning light brown on the edges but not cooked completely. While French fries are baking brown ground beef and onion in a large skillet until onion is soft and ground beef is cooked through. Drain any grease from pan. Add Worcestershire sauce, garlic, beef stock and pepper to the beef. Stir well and bring to a slow boil. Stir cornstarch and water together until dissolved. Add to mixture to the meat and stir. Once gravy starts to thicken taste and adjust spices to your liking. If gravy does not thicken add one more TBSP of cornstarch and cold water mixture to pan. Remove meat mixture from heat. Spread meat in an 13×9 casserole dish that has been sprayed with non-stick spray. Place partially cooked French Fries over the top of the meat mixture in a single layer. Place casserole dish in oven at the same temperature the French fries were cooking. Once fries have turned crispy and brown remove casserole and let sit for 5 minutes before serving.